Lately, it seems as if we wake up to a new atrocity each day. Every morning is now a ritual of scrolling through our Twitter feeds or scanning our newspapers for the latest updates on fresh horrors around the globe. Despite the countless protests we attend, the phone calls we make, or the streets we march, it sometimes feels like no matter how hard we fight, the relentless crush of injustice will never abate. David Shulman knows intimately what it takes to live your beliefs, to return, day after day, to the struggle, despite knowing you are often more likely to lose than win. Interweaving powerful stories and deep meditations, Freedom and Despair offers vivid firsthand reports from the occupied West Bank in Palestine as seen through the eyes of an experienced Israeli peace activist who has seen the Israeli occupation close up as it impacts on the lives of all Palestinian civilians. Alongside a handful of beautifully written and often shocking tales from the field, Shulman meditates deeply on how to understand the evils around him, what it means to persevere as an activist decade after decade, and what it truly means to be free. The violent realities of the occupation are on full display. We get to know and understand the Palestinian shepherds and farmers and Israeli volunteers who face this situation head-on with nonviolent resistance. Shulman does not hold back on acknowledging the daily struggles that often leave him and his fellow activists full of despair. Inspired by these committed individuals who are not prepared to be silent or passive, Shulman suggests a model for ordinary people everywhere. Anyone prepared to take a risk and fight their oppressive political systems, he argues, can make a difference—if they strive to act with compassion and to keep hope alive. This is the moving story of a man who continues to fight for good in the midst of despair. An indispensable book in our era of reactionary politics and refugee crises, political violence and ecological devastation, Freedom and Despair is a gripping memoir of struggle, activism, and hope for peace. "Artful yet often passionately angry. . . . An earnest and valuable jeremiad insisting, reasonably, that ethical behavior is imperative when parsing the nearly impossible Israeli-Palestinian conundrum." "For fifteen years, David Shulman, a renowned scholar of South Asian languages and religion has been involved with Ta‘ayush, whose name is the Arabic word for coexistence. The group has been protesting in the South Hebron Hills, in Area C of the West Bank, where some 300,000 Palestinians, most of them farmers and shepherds, live, in about thirty villages. . . Freedom and Despair is an account of his experiences there and an attempt to understand the deep antipathy that drives the violence and destruction in the region." 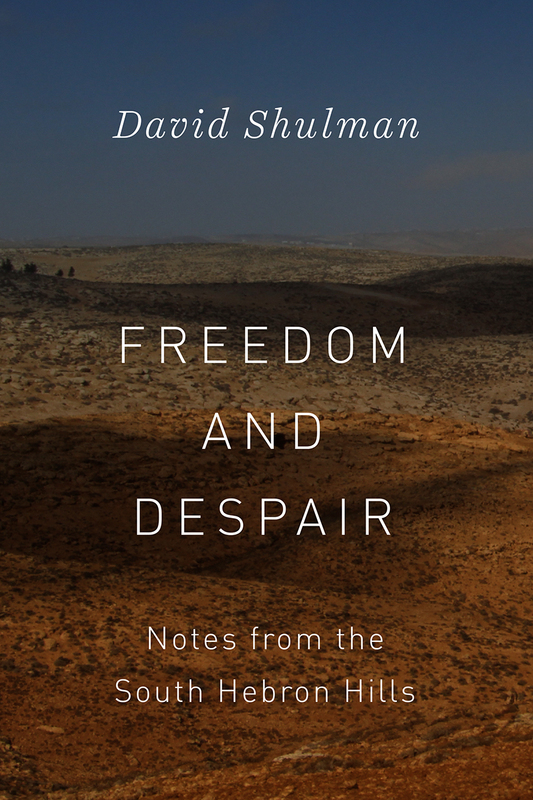 "Shulman eloquently and sensitively captures the beauty and the horror of the occupied West Bank. He is deeply attuned to the particularities and the paradoxes of the place." "Poetic and filled with empathy. . . Compelling."